Over 580 pages of documented material, referenced with over 1900 footnotes, eleven appendices with late 17th and early 18th century transcriptions and supporting bibliography. Full name index, and full place index. 100 illustrations, most in color, including publication quality reproduction photographs featuring landscape paintings and family portraits of his immediate family by Asher Brown Durand never shown before in a study like this. Maps authentic to the period from the Library of Congress, Colonial Williamsburg Foundation, and early Connecticut towns dating back to as early as 1646 are included. Autographs from original Revolutionary War pension records and grantor/grantee deeds from many of the early descendants are also included. Dr. John Durand, born in La Rochelle in 1664 into a Huguenot family, sought freedom from persecution. Persecution of Huguenots culminated in Louis XIV revoking the Edict of Nantes in 1685, forcing them to flee France. 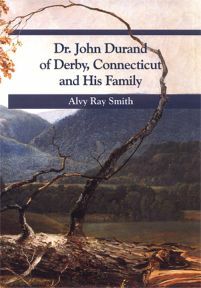 Dr. John Durand married in 1698 in New York City Elizabeth Bryan, the daughter of a wealthy merchant family, and settled soon after in Derby, New Haven County, Connecticut. Asher Brown Durand, a founder of the Hudson River School of landscape painting, and his brother Cyrus Durand, an accomplished designer and inventor of specialty machines, such as the geometric lathe, were both responsible for the intricate designs we see on currency, stamps, and stock certificates today in the 21st century. Professor William Frederick Durand, one of the fathers of aeronautics, was awarded the Presidential Medal of Merit by President Harry S. Truman. The Aeronautical and Astronautical Engineering building on the Stanford University campus is named for him. Durand, Michigan was named for the Honorable George Harman Durand, U. S. Congressman from Michigan. Nelson Crawford Durand ran Thomas Edison Company Dictaphone Division. 18th and early 19th century chairs designed by Durands are on exhibit today at Winterthur Museum in Delaware and Milford Historical Society in Connecticut. Maude Durand was a celebrated Broadway actress in the early 20th century. Andrew Durand son of Dr. John Durand, married to Jane Andrew, daughter of Rev. Samuel Andrew, a founder of Yale University, began the long Durand association with Yale University. Henry Strong Durand wrote Yale University's unofficial alma mater song Bright College Years. Baldwin, Bryan, Johnson, Riggs, and Treat families of early Connecticut and New Jersey are intertwined with the Durand family. 490 descendants detailed, with over 400 surnames intermarrying the Durand family over three centuries. Additional geographical areas featured as the family spread west are Litchfield County, Connecticut; New York City and Schoharie County, New York; Kane and Jersey Counties, Illinois; Miami, Cass, and Steuben Counties, Indiana; Denver and Weld County, Colorado; Genesee and Saginaw Counties, Michigan; LeSueur and Rice Counties, Minnesota; Benton County, Iowa; Waupaca County, Wisconsin; Summit, Cuyahoga, Crawford, and Williams Counties, Ohio; and Topeka, Kansas.